The 2015 Autumn-Winter tour at Danang brings ultra convenient services together with the top services of the central Vietnam, unique and completely new, suitable for intelligent tourism trends as well as actual needs of individuals, visitor groups who like to experience the wonderful living space in the paradise resort of the central Vietnam. Autumn-Winter 2015, from September 5th 2015 to December 22nd, 2015. • Utility for 2 nights at 3-star hotel and 1 night at 5-star hotel. • Enjoying premium services of the 5-star yacht Harems on beautiful Han river. • Community tourism – Experiencing the character culture of Co Tu people. • Restoring health with mineral mud bath service at Galina Danang right at the beautiful My Khe beach. Morning: Car and Tour Guide of Vitours welcome you at Da Nang International Airport. Noon: Lunch at the restaurant. (After 13:00, tourists join in the tour group). Afternoon: Visit Danang Museum – where has been keeping more than 2,500 documents, photos and valuable historic and cultural exhibits of Danang city and its vicinity. Taking photos at the City Administrative Center – the aspirational symbol of Danang. The car continues to take visitors along the eastern side of Son Tra peninsula (Monkey Mountain) to enjoy the whole sea city from above. Visiting Linh Ung Pagoda – where has the 65m high of Bodhisattva Kuan-yin in Vietnam. Taking sea bath at My Khe beach – which was voted as one of the most charming beach on the planet. Evening: Dinner at the restaurant. Freely enjoying and exploring Danang’s beauty at night with colourful lights. Sleeping at 3-star hotel. Morning: Buffet breakfast at the hotel. Starting the day with a journey Community Tourism – Experiencing Co Tu Culture by travelling on the highway 14G. Along the way, tourists join in activities, games on the car. Visiting tea plantation Quyet Thang to learn how tea is processed and to take beautiful pictures of the nature. Coming to Bho Hoong village, visiting the house Guol with exhibits about life and local culture. Activities of community services are disseminated and started through teambuilding activity. Mission I: Fun Season – supporting the community on harvests/ plant crops. Mission II: Give Me A Ticket To Childhood – helps and having fun with Co Tu kids. Mission III: Lighting Up The Fun Day – supporting short-of-manpower families, the elderly, people in special circumstances. Afternoon: Visiting of one the respected village elder, receiving lucky gifts as Co Tu customary. Leaving Bho Hoong village for Drhoong village. Taking photos, enjoying, shopping special and specific bead textile products of villagers. Departing back to Danang. Evening: Dinner on the 5-star Harems Yacht, enjoying the beauty of Han River at night. Spending the night at 3-star hotel. Morning: Breakfast at the hotel, check-out. Going to relaxalation place, restoring healt at Galina Danang resort- Mud Bath & Spa. Moments of enjoying and relaxing in smooth and warming mud will bring tourists an unforgettable experience, and feeling of absolute relaxation. Especially, the swimming pool with mineral water which is heated in cold season or winter will be the solution for those who like to swim in the winter. Noon: Lunch at the local restaurant. Check-in the 5-star hotel. Afternoon: Relaxing and enjoying the comforts at the hotel. Evening: Enjoying seafood in the coastal city of Danang at the restaurant. Spending the night at the 5-star hotel. Morning: Buffet breakfast at the hotel. Tourists are free to relax at the hotel or attend in daily tour Ba Na Discovery (VND 700,000/ person). Noon: Check-out. The car and tour guide welcome tourists for lunch. Afternoon: Shopping for souvenirs /specialities of the Central Vietnam. Seeing off to Danang airport. Ending the tour. THE ALL-IN PRICE: 4,999,000 VND/ person. 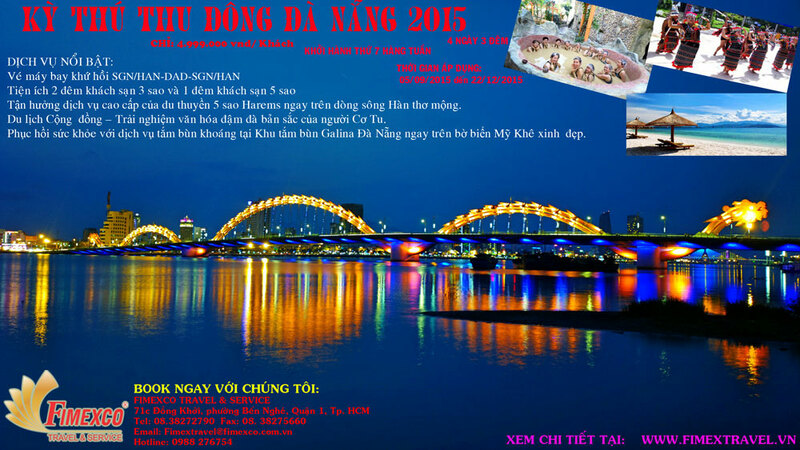 (Prices are only applied for Vietnamese people and those who book the tour at least 15 days before the departure day). 1. The price of round trip airline ticket: SGN/HAN – DAD – HAN/SGN. 2. New cars, luxury pickup – seeing off & services according to the tour schedule. 3. Experienced tour guides, dedicated served. 4. 2 nights in 3-star hotel and 1 night in 5-star hotel (Samdi hotel or equivalent). 5. Meals as the tour schedule. 6. Mud bathing service at Galina. 7. 5-star Harems yacht service. 8. Travel insurance, mineral water served in the car. 9. VAT & service charge. Personal expenses and not included in the tour/ trip. + 0-2 years old: 10% of the all-in price if tourists use Vietnam Airlines (parents take care of their children: eating, walking, sleeping). + 2-5 years old: 50% of the all-in price (airline ticket, sharing bedroom with parents). + 5-12 years old: 75% of the all-in price (airline ticket, separate seat in the car, having their own meals; sharing bedroom with their parents). + Children from 12 years old and older: 100% of the all-in price. (having services as an adult tourist). Feel free to contact us for your trip to be the best served. 71C Dong Khoi Street, Ben Nghe Ward, District 1, Ho Chi Minh City, Vietnam.